Aunt Dandelion expects you received some presents for Christmas or Hanukkah. No matter who gave them to you, and no matter how much you liked or disliked the gifts, a thank-you note is still obligatory. Written thank-you’s are becoming more and more rare, which is a little odd considering the ease of communicating by so many means today. Here are some tips to help you express your appreciation to those who thought enough of you to give you a present. When you receive a gift in the mail, let the sender know at once that it has been safely received. This can be done with a quick email or phone call, and will give the sender much peace of mind. As soon as you open the gift, or the day after the celebration for which it was intended, sit yourself down and write some personal words of appreciation for the gift. It doesn’t matter if you loved it or hated it. You are thanking the giver for the thought and effort behind the gift. Immediately say “thank you!” and tell them that you can’t wait to open it on the big day. Follow up on another day (very soon!) with a written thank-you. You can refer to the giver’s kindness or thoughtfulness in selecting that particular gift for you. The answer is simple: you say “thank you.” A thank-you note is not a review of the gift. So even if you received the world’s ugliest sweater or an unwanted nose hair trimmer, never show any offense or make comments that crab the gift in any way. Do invest at least a sentence or two in describing how much you like the gift, or how appreciative you are that they went to the trouble of giving you something. Pen and paper, or electrons? 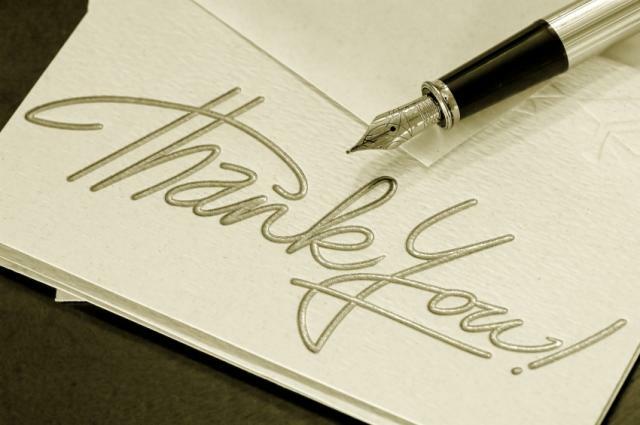 The handwritten note is now and always has been the gold standard in saying thank you. However, Aunt Dandelion feels that the intention and sincerity behind the note is of more importance than the medium. The key thing is to select a personal medium - i.e., a post on the giver's Facebook wall is neither correct nor sufficient. If your handwriting is not very attractive, one option is to type a thank-you letter, set it in an attractive, readable font, and print it on nice stationery. Sending an email is an acceptable alternative, but a thank-you email requires thought, and should pass the same test for formality of language and appearance as a hand-written note or letter. E-cards are also acceptable, but be sure to write something substantial in the area provided for your personal message. The downside of e-cards is that they usually can’t be saved on the recipient’s hard drive, or printed out, so they have less permanence than other methods. Aunt Dandelion still prefers a gracious personal note for major gifts or favors rendered. The medium you choose should be thoughtfully geared to the recipient’s preferences. Older people usually prefer paper-based correspondence. Have more questions about holiday etiquette? Send your concern to ask@auntdandelion.com.